Description: Layered with notes of apple peel and creamy green banana, this year's harvest lives up to the signature flavor profile and reputation of a well-made Koroneiki. This classic Greek varietal is both balanced and fresh. 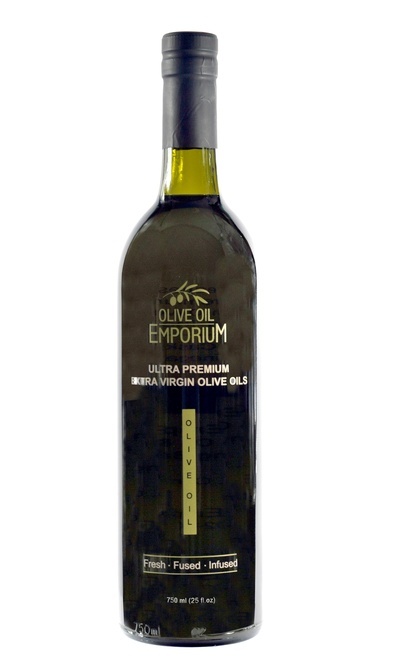 The Koroneiki olive grows in abundance in Greece, is very small and difficult to cultivate, but it also has one of the highest oil contents, typically 20-30% oil. The overall yield of oil per tree is much lower, but its return is an oil of exceptional quality. The common production of olive oil per tree is 10 litres, while the Koroneiki variety produces only 1-3 litres of the rich gold-green juice. This small olive, however, delivers a healthy punch and a consistently low acidity. The Koroneiki olive also has a very high level of polyphenols, the chemical substances found in plants that may reduce the risk of heart disease and cancer. The oil is high in oleic acid and very stable, which means it has a very good shelf life. It is a varietal that is also more resistant to insects and droughts than many other olive varietals. Tasting Profile / Serving Suggestions: This year's Californian Koroneiki is quite fruity, and with strong notes of banana flavors, the signature flavor profile of any well made Koroneiki. Our Californian harvest of this classic Greek varietal is quite complex and delightfully pungent with herbaceous notes and notes of green apple. It is a well-made organic Koroneiki that is fabulous as a finishing oil with any salad, and all vegetable dishes. Enjoy over bean salads, grilled vegetable dishes and meats, and roasts. Hojiblanca Extra Virgin Olive Oil "Melgarejo"